The Book of Ra casino slot online is available in almost every casino online you will come across. The game is so widespread that it has become one of the most popular releases developed by Novomatic. However, despite its popularity, this slot has plenty of drawbacks and limitations that might make you think twice before spinning the reels. Before we get into explaining the features of the game, it is important to mention that the structure of the machine features five reels and nine paylines. 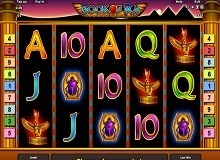 As you might have assumed from the title of the slot, its story is related to Egyptian mythology. The action revolves around a skillful explorer who travels from America to Egypt with the mission to find the Book of Ra, which is a century old book that hides thousands of Egyptian secrets. Before we get to the most important part of the review, that is, the discussion of features and rewards, we have to take a look at the betting limitations that players need to know before spinning the reels. There isn’t much to say when it comes to the betting options of this slot machine. Novomatic developers have kept things pretty simple here. Players can easily set up their wager by using intuitive betting options and buttons on the panel. The betting range goes from as little as one coin to the maximum amount of 900 coins per spin. Such a low limit attracts many low stake players who want to enjoy the feeling of betting without risking too much money. 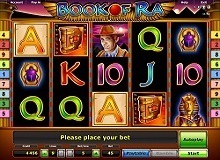 Therefore, the Book of Ra slot is suitable for both high rollers and those players who like to keep the bets low. Either way, the rewards after each spin match the risks you have taken. In other words, the more money you place on the line, the more cash you might win back once the spin is over. The easiest way to score rewards in this game is through simple symbol combinations. However, these combos only bring average prizes. If you want to score larger wins, you need to look out for the Book of Ra symbol, which is the most important symbol of the entire slot. Interestingly, this icon serves as both the wild and the scatter symbol. As a wild, this symbol can replace any other icon on the reels in order to multiply your rewards. However, as a scatter, the Book of Ra can activate the Book of Ra free spins mode where you will be rewarded with ten free rounds. During this feature, players will also be rewarded with an expanding wild that is randomly chosen on the reels. This special wild can take up three positions on the reels in order to boost your chances of winning larger payouts. Besides the wild and the scatter bonus, the game has one more special icon that can bring players great amounts of money. 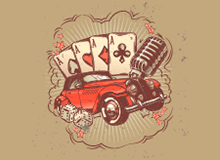 Represented by the explorer, this icon can trigger the game’s jackpot, which is the highest payout of the slot. However, if you play Book of Ra for real money, you can only have a chance to score the jackpot if you spin the reels at maximum bet. It takes a total of five explorer symbols in order to win the grand prize. 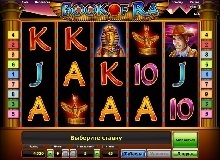 The Book of Ra casino slot online is not an average slot machine. This unique release from Novomatic offers a great theme with great visuals and sound effects following the story. A total of five reels and nine paylines might not sound like a lot but it is more than enough to score great wins if the right symbols come your way. What’s great about this slot machine is the unique free spins feature that comes with a special expanding wild. What makes the slot so different from other casino online betting games is the fact that one symbol serves as the wild and the scatter. Overall, the game doesn’t offer any extra special features but it is fun to play every once in a while. If anything, you can expect to score ordinary combinations quite regularly but you will have to bet the maximum amount if you’re aiming for the big jackpot or other higher rewards. If you’re a high roller, this slot is a great opportunity to go all in and shoot for the jackpot!